Twin or Full hook in rails for Twin and Full size bedding. 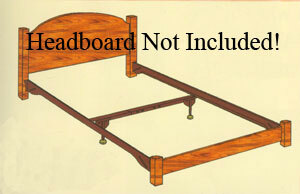 Hook in rails require both a headboard and footboard to hook into and provide support. This is an excellent frame which includes a steel center support with legs with threaded glides that adjust to reach the floor. Twin or Full hook-in rails. Includes legs and center support.